CONTROLRadioUK #IfWeLikeIt #WePlayIt: Legends of Tomorrow Wet Hot American Bummer Review: "Who Doesn't Love Camp?!" 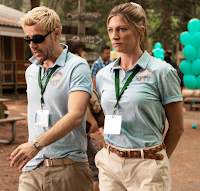 Legends of Tomorrow Wet Hot American Bummer Review: "Who Doesn't Love Camp?!" Legends of Tomorrow surely wins the award for most inventive way to introduce fugitive of the week right? How many villains of the week have ever been introduced through watching a horror movie on Netflix with your bae, only to realize there's something wrong with said horror movie and soon have the phone ringing to confirm your suspicions? 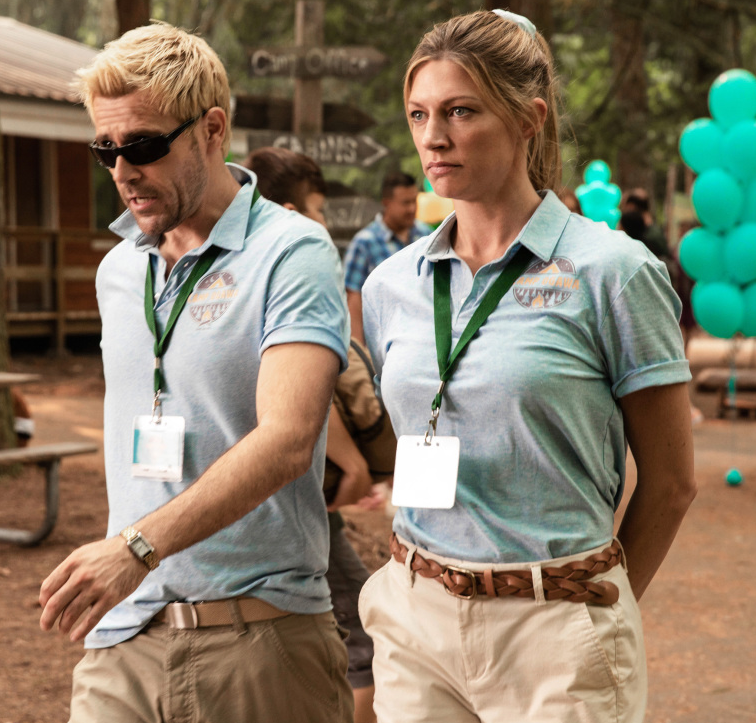 'Wet Hot American Bummer' saw Constantine, Sara, Ava and Ray take a trip to a summer camp where kids were disappearing. Whilst the head counselor didn't care, proclaiming that kids were always going off, it didn't take the gang long to realize they were disappearing into thin air because of a swamp monster. It fed off the life force of children to make itself stronger, but thankfully because the process took a few days, there was still hope of getting the kids back alive. Unfortunately a group of adults trying to infiltrate a group of kids and make them confess their deepest, darkest secrets was not an easy task. Ray attempted to bond with the kids by teaching them about safety. Constantine brought out the magic tricks and discovered just how horny prepubescent boys can be. Having previously attended camp, Sara had the best approach of gaining the girls trust by showing them how fun she was. Ava however decided that discipline was the best way forward, and soon the only thing she was doing was uniting all the girls in their dislike of her. Sometimes it can be extremely easy to forget that Ava is a clone. 99% of the memories and experiences she's had are fake, memories installed into her brain to give her a sense of belonging. She doesn't really understand people and is quite slow to get humour or pick up on the fact the Waverider was housing Charlie because she looked like Amaya, instead buying Sara's lie that they were keeping her for research purposes. Sara found it easy to bond with the girls because she's been one just like them, getting up to trouble and viewing counsellor's as the enemy of the world. She could immediately tell Ava's hard nose for discipline wasn't working, but Ava didn't truly comprehend Sara's concerns and instead doubled down on how people need discipline and they were there to save lives not have fun. With the girls all closing ranks, Sara turned to Constantine for help and he whipped up a potion that turned Sara & Ava into kids. Doing so allowed them to get close enough to the girls for them to open up and reveal all about the mystery dissapearances in the camp, whilst also allowing Ava to experience a childhood. She was still extremely awkward, which the show played well leaning into the comedic aspects of it, and kid Sara was there to help guide kid Ava through minor missteps and a dare that allowed her to gain favour with the other girls. Usually I'm not a fan of swapping out characters, but here it worked extremely well with the kid versions of Ava & Sara perfectly matching their elder counterparts mannerisms. Did I find it slightly unrealistic that two teenage girls would be able to take on a swamp monster, and kid Sara was able to eventually defeat him? Yes, but given John and Ray were busy restoring life force to the kids who had been kidnapped and Constantine wound up in dire straits, the girls really needed to be their own hero's. Red herrings aren't something that shows can pull off in this day and age. When you have a character who is an unpopular grouch painted as the one who is the villian? 99.99% of the time it's going to be revealed that they're actually not and the nice, fun approachable counterpart is the big scary monster. The shedding of the skin was an interesting twist on the monster of the week, but even that ended up being inconsequential as the episode was about Ava/Sara teaming up for the first time this season, Constantine being willing to do whatever it took to save a child and Charlie's animosity with the team coming to a head and resulting in her becoming a member of sorts. Given she is a series regular this year, at some point the story was going to have to go back to Nora Darhk and it says a lot about how much Damien outstayed his welcome that he hasn't at all been missed so far this season and neither has Nora. Sure we've had the odd mention of her due to Ray processing his infatuation of her and it being revealed to the team that he let Nora go, but outside of that 4 episodes into the new season? The show has successfully reinvented itself yet again with monsters of the week and knowing when to have the full cast on show and when to have some of them sit on the sidelines. Case in point this weeks episode didn't feature Nate or Gary with the explanation that they were at the Buereau's headquarters working, and as much as Gary is fun and Ray was missing Nate, there was so much going on in the episode that the viewer barely had time to register they weren't on screen. Having a character like Nora around can potentially drag the show back down and repeat the error in overusing Damien for multiple seasons. Using so much magic to restore the kids life force drained Constantine tremendously and with his body not reacting well to Gideon's medication, the idea is presented that if dark magic took his life force away, it can also restore it and the only person they know who has successfully dabbled in the dark arts is of course Nora. Whether or not her character works in the long term is something that can't be judged just yet, and maybe she will be more tolerable without hanging in Damien's shadow. Legends of Tomorrow's 4th season has gotten off to a solid start which 'Wet Hot American Bummer' continued and whilst the ratings may not be stellar and it is facing a long midseason absence from our screens, there's no denying it is still the best DC show on The CW.